FOLIE A DEUX 10yr old Gelding by Anshan ex Flynn’s Girl. OR Hurdle 100, Chase 105. Fit and Ready to run. Fun horse. £5,500. 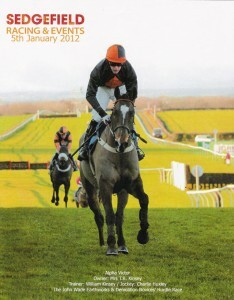 Entered to run Sedgefield 07/02/12. 4yr old gelding by Heron Island ex Dawn Native, 2 tenth shares available. £2,500 per share. Exciting N H Bumper prospect. WILL KINSEY got his training career off to a dream start with a 260-1 double courtesy of Alpha Victor in the novice hurdle and Kykate in the 2m4f handicap hurdle. The pair, both ridden by Charlie Huxley, were the 30-year-old’s first runners under rules since he was granted a licence two weeks ago and Donald McCain’s former assistant received a rousing reception from family, friends and racegoers after each winner. Kinsey’s unbeaten record fell in the concluding bumper in which Gwladys Street finished a creditable third, while Huxley was fined £290 by the stewards for sending text messages during the restricted period.